It's winter and my skin is terribly dry. Within a couple weeks of the colder weather, my hands are cracked and bleeding from washing dishes and my skin is so dry after the shower that it literally flakes everywhere. I usually have to lotion my face at least twice before my dry skin finally has enough moisture, but the result? Breaking out with pimples like an adolescent teenager. Finding all-natural, chemical-free skin moisturizers is possible, but they are usually very expensive, and justifiably so considering that organic materials are more costly then the laboratory man-made chemicals most lotions contain. Most conventional lotions contain parabans, petroleum derived materials (yes, that is the same stuff gasoline is made from) and sulfates, which all have harmful long-term side-effects, and more testing is still being done. This 100% all-natural, organic, chemical-free and affordable miracle skin care is a simple kitchen ingredient that I've blogged about before - coconut oil! Yes, the same stuff that I am cooking with is my face and hand moisturizer and it works wonders! My initial thoughts when I learned that people use coconut oil as a face moisturizer was, "Won't that clog my pores and cause me to break out more?" The answer from experience is simply no. Coconut oil contains lauric acid, capric acid and caprylic acid whose properties are antimicrobial, antioxidant, anti-fungal, antibacterial and more. It also helps with maintaining cholesterol levels, weight loss, increased immunity, proper digestion, stress relief and more. So in essence, it is not only moisturizing my face, it is naturally healing it. It's also affordable to find organic, cold-pressed coconut oil at your grocery store and you only use a minimal amount (about 1/8 tsp for the face), so a little goes a long way. I'd like to share a story about coconut oil's many healing properties that we personally experienced this year. My daughter Philomena contracted a rare secondary virus called Papular Acrodermatitis as a result of being exposed to the Coxsackie Virus (aka - the hand, foot and mouth disease that ran rampant last spring). Ironically, she never got the coxsackie virus which is highly contagious, instead she just got the secondary infection which is not contagious but made her look like she should be quarantined due to the thousands of bumps that showed up all over her body. The doctor's were clueless as to what it was until they realized it wasn't going away after 4 weeks, but instead getting worse on a daily basis. Once she was diagnosed, it was explained that there is nothing we could do for her, that she would get worse before she got better and that it would last for another 4-6 weeks. Feeling helpless, we contacted Dr. Axe to see if there was anything we could naturally do for her since it was a virus and he said to of course keep her on an anti-inflammatory diet, give her some adult probiotics and lather her up with coconut oil. Within days there was a huge, noticeable difference in the size of the bumps and within a week her skin began to clear up. Where modern medicine had no answers, our cooking agent and probiotics ended up helping her to heal. 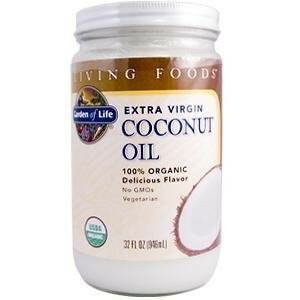 For more information on where to find coconut oil near you, visit the Where to Buy page. To read more on using coconut oil as a cooking substitute and its health benefits, read my blog on Substitutes and read this informative article on other uses for coconut oil.